This shade-tolerant lichen of sheltered cliffs and underhangs of siliceous rocks can form considerable mosaics, often covering extensive areas. 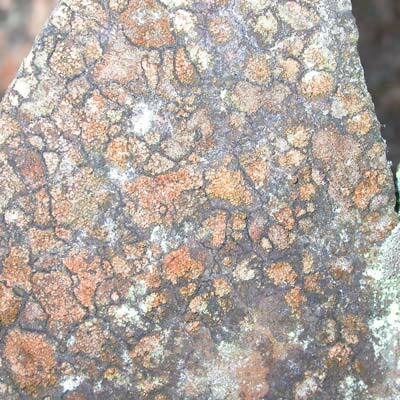 The pale to dark brown speckled thallus delimited by a black-lined border is covered with orange-brown powdery soralia giving the surface a flecked appearance. This may coalesce to form broader patches. Grooved, stubby-black discs (lirellae) do occur, but are not always present. It is frequent on rock outcrops in woodland and on boulders along river corridors. It can also occur on acid rock in churchyards. A dab of Calcium hypochlorite (C) will turn the soredia red. 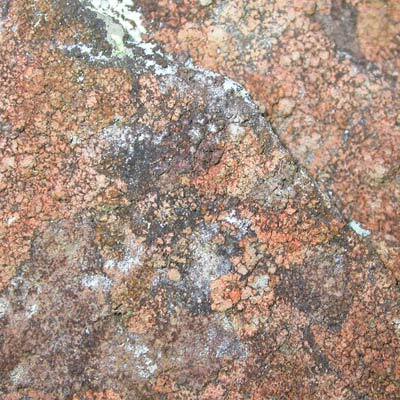 It occurs low down on shaded acid rock on surfaces never exposed to sunlight. Simms, M. J., (2016). Opegrapha gyrocarpa Flot.. [In] LichenIreland.